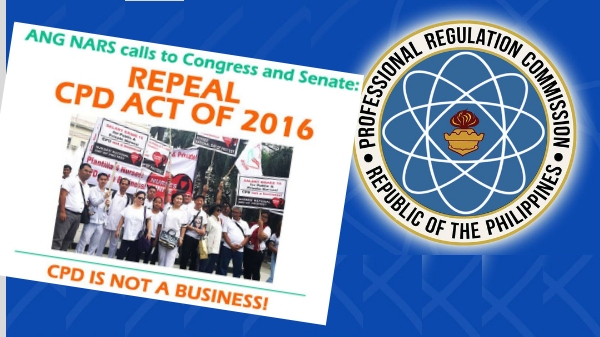 MANILA, Philippines – Nurse advocacy group “Ang Nars Partylist” is the latest group to call out the repeal of the controversial Republic Act 10912 or the Continuing Professional Development (CPD) Law. Under the CPD Law, all professionals are required to earn CPD units by joining formal and non-formal training for the renewal of their Professional Regulation Commission (PRC) Identification Card every three years, effective July 1, 2017. On their official Facebook page, Leah S. Paquiz, the Founding President of Ang Nars gave a lengthy explanation on why the CPD Law’s implementation has failed. Paquiz pointed out that while the objective of Continuing Professional Education is important, the implementation of the CPD Law has become a burden to the local professionals. It can be recalled that Paquiz is one of the co-authors of House Bill No. 6423 or the Continuing Professional Education Act. It was later on amended and adopted by Senate Bill No. 2581 or the Continuing Professional Development Act of 2015 which was authored by Antonio V. Trillanes IV, Cynthia A. Villar and Francis G. Escudero. The latter lapsed into law as Republic Act No. 10912 or the Continuing Professional Development (CPD) Law on June 30, 2016. Ang Nars Partylist commended Senator Ralph Recto’s Senate Bill No. 2073 that seeks to abolish the CPD Law. This is not the first time that Leah S. Paquiz and the Ang Nars called out the rules and regulations of CPD Law. 1. CPD must stop the proliferation of expensive trainings and seminars that have no corresponding approval / accreditation by the PRC. 2. CPD must be used to strengthen IN-SERVICE trainings given by employers to their workers, FREE of cost. 3. CPDs should be relevant and benefit the participant and given at a REASONABLE cost. 4. CPD must be a bridge to legally recognize certification or specialty learnings programs previously taken by the professionals. Leah S. Paquiz was a Representative of Ang Nars Partylist in the 16th Congress (2013-2016.) On October 18, 2018, the Ang Nars Party-list filed their Certificate of Candidacy for the 2019 Midterm Elections for their 8-point Legislative Agenda.